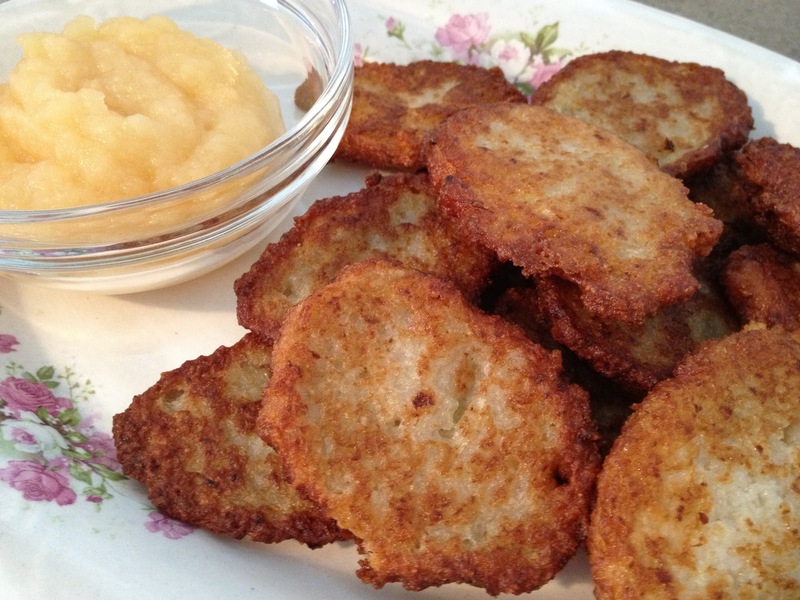 My mother’s potato latkes are the best and she makes them vegan now, not just for us, but whenever she makes them. This recipe is based on one from her friend Roz. Roz says the key is to make them ahead of time, freeze them, and then put them in the oven frozen. They come out great every time and are always the centerpiece of the party! Serve with homemade applesauce. Enjoy! Whip up the flax eggs and set aside. Peel the potatoes and place them along with the onions into the food processor. Chop them as finely as possible. Pour into a strainer and drain out as much of the water as possible. Mix the rest of the ingredients into the onions and potatoes. Fry up in safflower oil until golden brown on both sides. Drain on paper towels and then freeze. When ready to serve, bake in a 450 oven until hot.